ALL CLEAR All buildings at UTHealth are open and operational. This Web site is designed to provide the UT Health Science Center community with the most current information about campus building, school and information systems status. To contact the UT Police Department 24/7/365 dial, 911 for Emergencies and 713-792-2890 for non-Emergencies. Stay informed of local weather conditions, watches and warnings from the National Weather Service, view area evacuation maps and current Houston traffic conditions. Employees with offices in the McGovern Medical School, UT Professional Building or Jesse Jones Library Building may call 713-500-7999. Harris County Psychiatric Center employees should call 713-741-5001. The status of operations at each UT Physicians location is determined by the UT Physicians administration. 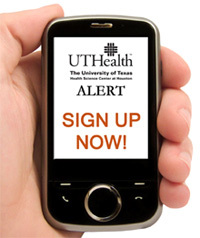 All UT Physicians employees are expected to report for duty at their scheduled time unless otherwise requested. If there is a clinic closure, practice managers will notify their staff using call trees devised and maintained by each individual clinic. All other employees and students may call 713-500-9996. Closings and other emergency conditions will be posted on this Web site. If Houston phone numbers listed above are out-of-order, please call toll-free, 1-866-237-0107 for university closure information. If these communication media are out of order or do not provide adequate information, employees should call their supervisors. All employees and supervisors are reminded to keep home phone numbers with them at home so that they can reach each other in case of emergency. Supervisors should exercise their best judgment in allowing UTHealth employees to use appropriate leave time in the event of family emergencies or concerns about getting to work safely. Employees should discuss their situation with their supervisor. Employees defined by their department as “essential” and employees and students with clinical obligations at hospitals and other locations should check with their supervisors. If the university is closed, formal classes will be cancelled. At the School of Dentistry, in case of unanticipated absence necessitating cancellation of patient appointments, it is the students' responsibility to notify their patients. At the McGovern Medical School, third- and fourth-year students should check with their attendings for instructions. At the School of Nursing, for master's level students in the nurse anesthesia program, if the hospital is open, the students are expected to meet their clinical obligations. At the School of Public Health, anyone with clinical duties is still required to fulfill those duties. Essential employees have been designated by their department heads as essential to the continued performance of their department and/or the university. Essential employees include faculty and staff who are required to sustain clinical services and/or who are responsible for the protection of university assets. Essential Employees will be required to report to their designated work site during their appointed work schedule even when the institution has been officially declared closed due to adverse conditions. If an essential employee cannot report to work, she/he must contact her/his direct supervisor to advise of her/his situation as soon as possible. Based upon past experience, 30 days post event is the most critical timeframe with regard to immediate recovery decisions, resource procurement, and the establishment of temporary means and locations of essential functions. The UTHealth Business Continuity Plan (BCP) is intended to describe actions and decision-making capabilities for that time frame by suggesting enhanced pre-event strategies to reduce or eliminate the impacts of emergencies at the local operational level. This process is on-going within the clinical, educational, and research mission areas with the assistance of Environmental Health and Safety. This element of the BCP is intended to provide a guide to essential institutional infrastructure services for the UTHealth community in the event normal operations are curtailed due to the occurrence of an event. If you or a family member has a disability and needs help to prepare to leave your home or shelter in place, visit www.disability911.com to see hurricane planning tips for people with disabilities, their family members and caregivers, as well as information for emergency planning and response. For more information see University Closure in Severe Weather in the Handbook of Operating Procedures (HOOP) or the Emergency Management Plan . METRO - Visit METRO for continuing information regarding service status. TREKEXPRESS/Fort Bend County Transit - For status on service, call 281-633-7433 or 713-965-1711.